For other species called turtle doves, see Streptopelia. The turtle dove is a migratory species with a southern Palearctic range covering most of Europe and the Middle East and including Turkey and north Africa, although it is rare in northern Scandinavia and Russia. It winters in southern Africa. According to the State of Europe's Common Birds 2007 report, the turtle dove population in Europe has fallen by 62% in recent times. Environmentalist groups have said that this is partly because changed farming practices mean that the weed seeds and shoots on which it feeds, especially fumitory, are more scarce, and partly due to shooting of birds in Mediterranean countries. According to a 2001 study cited by the European Commission, between two and four million birds are shot annually in Malta, Cyprus, France, Italy, Spain and Greece. Environmentalists have described spring hunting in Malta as particularly problematic as it is the only country with an EU derogation to shoot birds during their spring migration to breeding grounds. According to a 2007 study by the European Commission, four currently identifiable potential threats to the turtle dove are (1) habitat loss/modification (medium to low impact), (2) droughts and climate change (mostly unknown but likely low impact), (3) hunting (partly unknown but overall medium impact), and (4) competition with the collared dove (unknown impact). Smaller and slighter in build than many other doves, it measures 24–29 cm (9.4–11.4 in) in length, 47–55 cm (19–22 in) in wingspan and weighs 85–170 g (3.0–6.0 oz). the European turtle dove may be recognised by its browner colour, and the black-and-white-striped patch on the side of its neck. The tail is notable as the bird flies from the observer; it is wedge shaped, with a dark centre and white borders and tips. When viewed from below, this pattern, owing to the white under-tail coverts obscuring the dark bases, is a blackish chevron on a white ground. This can be seen when the bird stoops to drink and raises its spread tail. The mature bird has the head, neck, flanks, and rump blue grey, and the wings cinnamon, mottled with black. The breast is vinaceous, the abdomen and under tail coverts are white. The bill is black, the legs and eye rims are red. The black and white patch on the side of the neck is absent in the browner and duller juvenile bird, which also has the legs brown. The turtle dove, one of the latest migrants, rarely appears in Northern Europe before the end of April, returning south again in September. It is a bird of open rather than dense woodlands, and frequently feeds on the ground. It will occasionally nest in large gardens, but is usually extremely timid, probably due to the heavy hunting pressure it faces during migration. The flight is often described as arrowy, but is not remarkably swift. The nuptial flight, high and circling, is like that of the common wood pigeon, but the undulations are less decided; it is accompanied by the whip-crack of the downward flicked wings. The arrival in spring is heralded by its purring song, a rather deep, vibrating “turrr, turrr”. Despite the identical spelling, the "turtle" of the name, derived from Latin turtur, has no connection with the reptile; "turtle" in this case came originally from Latin tortur, onomatopoeic for the song. The genus name Streptopelia is from Ancient Greek streptos, "collar" and peleia, "dove". the Asian Oriental turtle dove S. orientalis and Spotted dove S. chinensis. the African dusky turtle dove S. lugens and laughing dove S. senegalensis. The turtle dove was, according to Aelian, sacred to Demeter. The Turtle Dove by Sophie Gengembre Anderson. Perhaps because of Biblical references (especially the well-known verse from the Song of Songs), its mournful voice, and the fact that it forms strong pair bonds, European turtle doves have become emblems of devoted love. In the New Testament, two turtle doves are mentioned as the customary offering during the Presentation of Jesus at the Temple. In Renaissance Europe, the European turtle dove was envisaged as the devoted partner of the Phoenix. Robert Chester's poem Love's Martyr is a sustained exploration of this symbolism. It was published along with other poems on the subject, including William Shakespeare's poem "The Phoenix and the Turtle" (where "turtle" refers to the turtle dove). The turtle dove is featured in a number of folk songs about love and loss. One of these is a setting by Ralph Vaughan Williams. Turtle doves also are featured in the song, "The Twelve Days of Christmas", as the gift "my true love gives to me" on the second day of Christmas. If added cumulatively, by the end of the song, the recipient has been given 22. 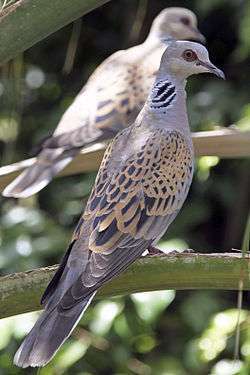 Turtle doves appear in the title and lyrics of a spiritual from the Georgia Sea Islands. In the Shaker hymn "In Yonder Valley", it is seen as a good omen and sign of growth that "The turtledove is in our land". ↑ BirdLife International (2015). "Streptopelia turtur". IUCN Red List of Threatened Species. Version 2015.4. International Union for Conservation of Nature. Retrieved 24 December 2015. ↑ Brehm (1891). "Turteltaube". Die Vögel (in German). 2. ↑ BirdLife International (2012). "Streptopelia turtur". IUCN Red List of Threatened Species. Version 2012.1. International Union for Conservation of Nature. Retrieved 27 Feb 2013. ↑ Benjamin, Alison (21 December 2007). "Study reveals severe decline of Europe's common birds". Guardian.co.uk. 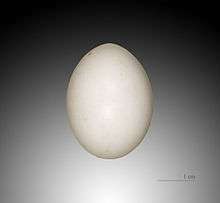 ↑ "Scientists warn of impending turtle dove British extinction". Malta Today. Retrieved 20 April 2015. ↑ "Malta votes in referendum on controversial spring shooting of migrating birds". Daily Telegraph. Reuters. Retrieved 20 April 2015. ↑ Jobling, James A (2010). The Helm Dictionary of Scientific Bird Names. London: Christopher Helm. p. 367. ISBN 978-1-4081-2501-4. ↑ "DEMETER ESTATE & ATTRIBUTES - Greek Mythology". ↑ "Meaning Of Turtle Doves." Rocketswag.com. Rocketswag.com, 2012. Web. 18 Nov. 2014. <http://www.rocketswag.com/animal/birds/doves/Meaning-Of-Turtle-Doves.html>. ↑ Kennedy, Michael; William, Ralph Vaughan (1992). The Works of Ralph Vaughan Williams. Oxford University Press. p. 178. ISBN 0-19-816330-4. ↑ The Associated Press (November 26, 2012). "'12 days of Christmas' cost: How much is a partridge in a pear tree?". The Christian Science Monitor. Retrieved 8 May 2014. ↑ Spiegel, Max. "Origin: Turtledove Done Drooped His Wings". Wikimedia Commons has media related to streptopelia turtur.